The room is much smaller with the twin bed, but we managed to make everything fit ok. We have the option to take the glider out and slide the dresser down, but for now our little guy still likes to sit and rock once in awhile. 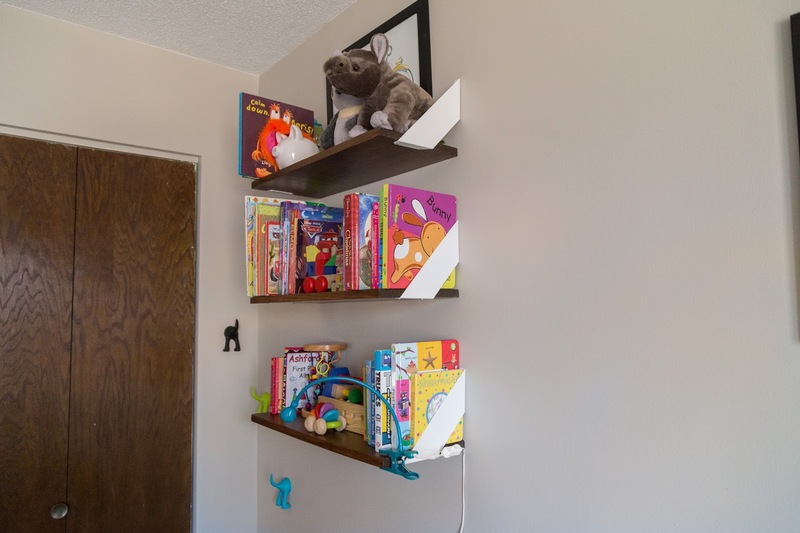 We did eliminate the little wood shelf in the corner, it was wobbly and that is just not good! I replaced it with these shelves. These were a cheap DIY project. 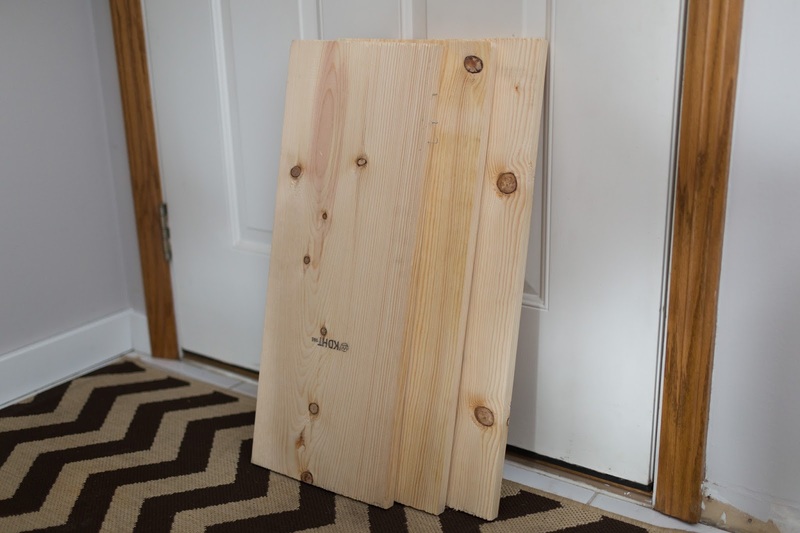 I bought three 2 foot pieces of pine building material (1x9s) from Menards for $1.55 each. They were not really meant to be stained because they had a ton of stamps, markings, neon writing, super rough edges, etc...but I did it anyway. I sanded the stamps and markings off the best I could, stained, poly'd, and used $2 'over under' brackets to attach them to the wall. The brackets were sort of hard to install, but we love them! And then I got the opportunity to do a little reading area under the shelves with some throw pillows I got on clearance at Target. Oh, and here you can see my 'example baseboard.' One day! While almost everything in this room is the same stuff from the old house, I did need to buy some things. Mainly, bedding. 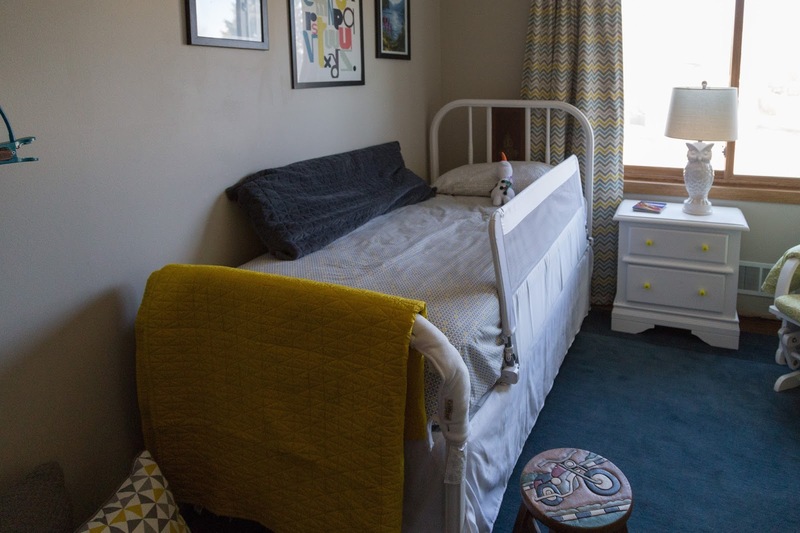 We had the antique bed, and just one set of twin sheets I used to stage the old house. 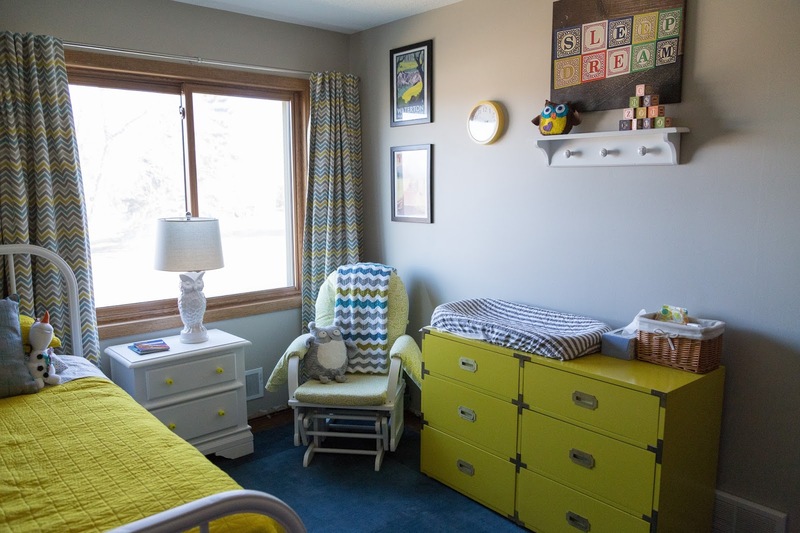 One of the most exciting purchases for me was the yellow quilt and sham from Target that almost exactly matches his dresser. I love it! One of the most exciting purchases for Ashford is the ABC poster from Ikea. He LOVES this thing, before I got it hung he would carry it down the stairs to the living room so he could show us how he can say his ABCs and point at the letters. In fact, he already dropped it and broke it before it got hung...but I'm just going to ignore that little bit of broken plexi in the corner! 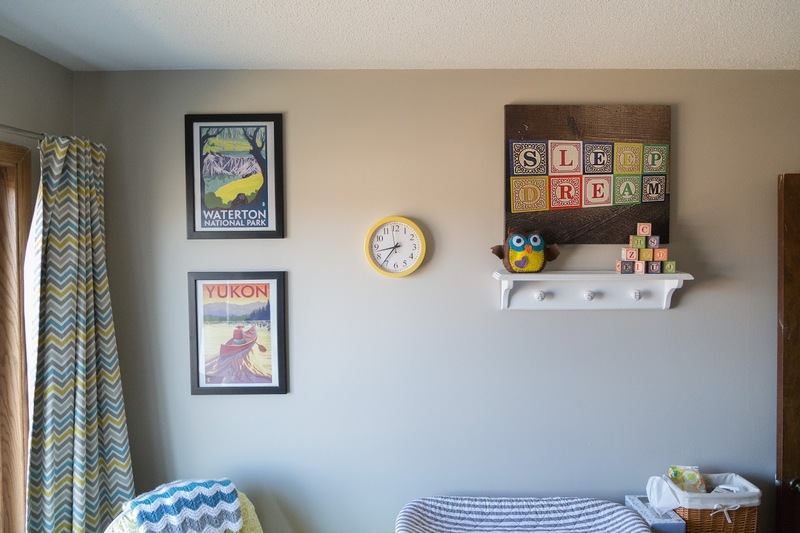 His other artwork looks good in here - even though he has a lot less wall space. His closet and main entry doors are still sort of an eyesore, but I'm still working on my plan for those. 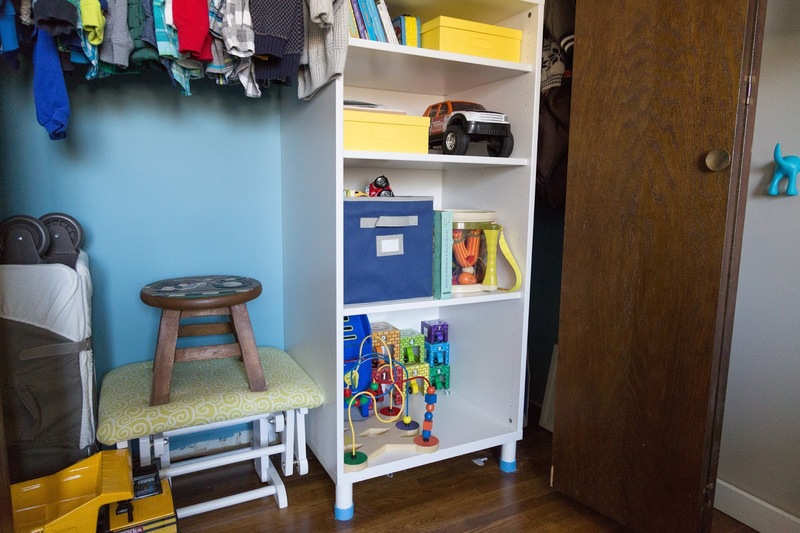 The inside of the closet was pretty run of the mill, so I painted it a fun accent color (Behr Voyage) that perfectly matches the blue in his drapes, painted all the existing shelving fresh white, and picked up a simple STUVA storage system from Ikea. It works well to hold toys at his level, rather than having them on the floor. As he gets older, we can add doors or drawers to customize it. We also keep the ottoman for the glider in here, so it's not cluttering up the main room. And the little stool is something he uses to get into (and out of) bed. It's pretty cute to see him using the stool because the bed is quite high! 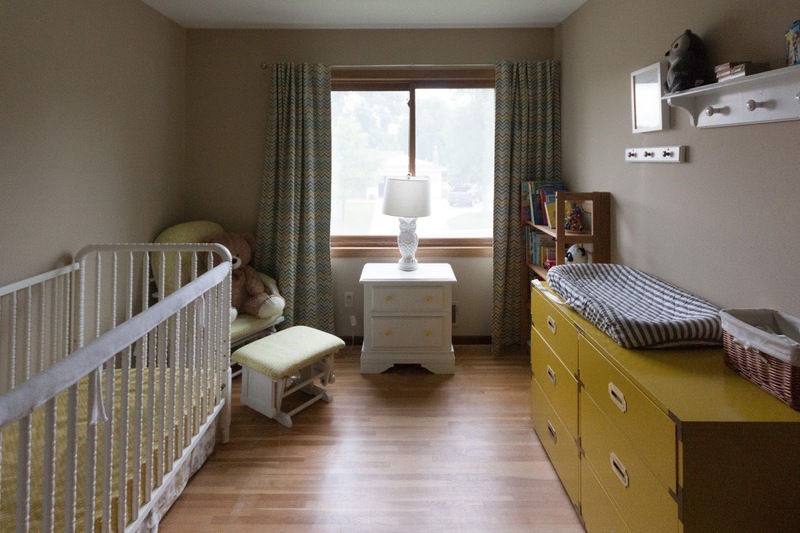 And in case you think I'm nuts to let my toddler sleep in this tall metal bed, here is what is looks like in real life! We always keep the foot board covered with the quilt, and he usually has a pillow there as well. The guard rail is a great investment because this dude is like a rotisserie chicken at night, he has fallen off many a bed and I often catch him totally squished up against the rail at night. 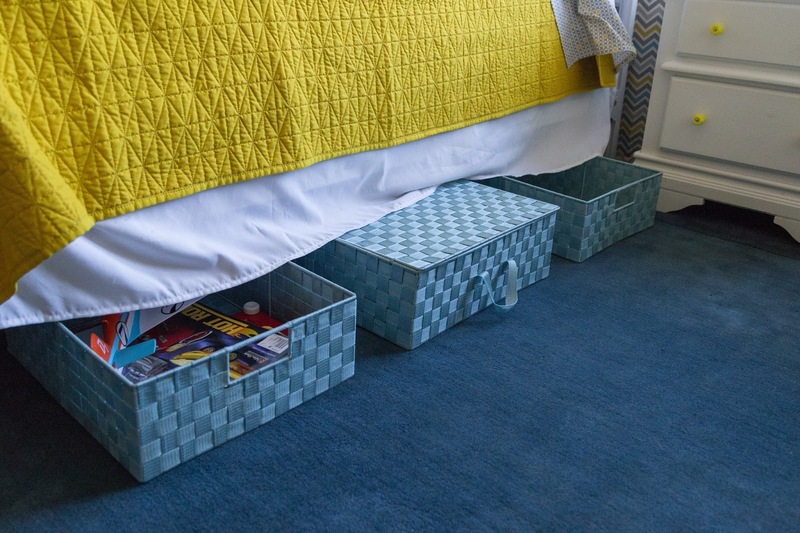 I also bought a few under bed baskets from Home Goods for easy clean up of clutter around the floor. So, that is about it! I believe I spent $120 on all the items from Ikea, $80 for the bedding and pillows, $25 for the bed rail, $35 for the baskets, and $18 for the three shelves. Add that to the couple gallons of paint, and it's more than I wanted to spend, but I think it's worth it to have an organized and nice looking room. 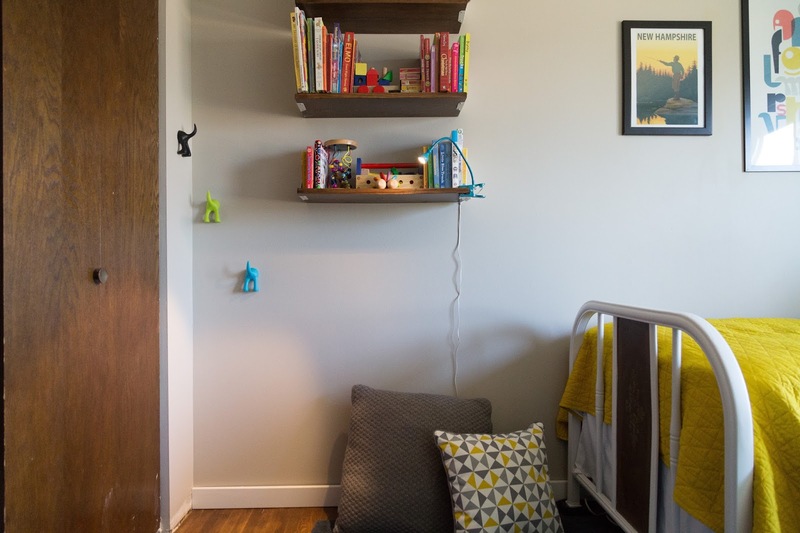 How have you designed around a tiny room? I'd love to hear your clever ideas! LOVE, sara! it's soooo fun! love the colors! what a happy room! 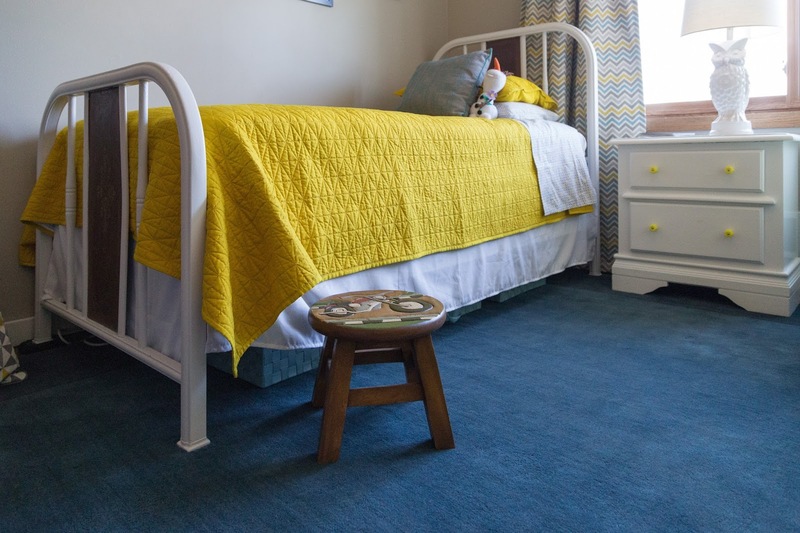 i like the yellow, and the blue rug. we have that same changing pad cover. although i couldn't believe it when i saw the twin bed - little guy is growing up fast! that means mine will be next - yikes! It looks so cozy :) It sounds like this isn't your forever home? Do you plan to stay in MN? There are some great older homes, particularly in the Twin Cities. It looks super cute! I love the blue and yellow together. The room looks great! Perfect for a growing boy. I have those shelf brackets in my bathroom and I love them! Thanks, everyone! SJ - no, this is not our forever home. We are not planning to stay in Minnesota, as soon my husband can get a position in the Chicago market, we will be on our way back. We just miss our families and it's so stressful trying to get together. I think it would be easier if we were farther away - then we wouldn't feel obligated to drive 6 hours each way for every holiday! I love when I see your name come up in my feed!! His room is so cute!! 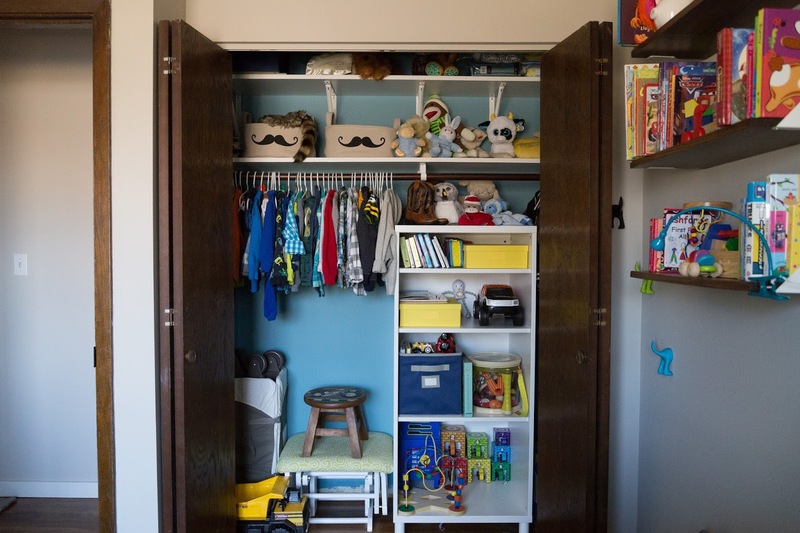 totally love his closet and need to incorporate some of your organizing ways in to Avery's room! 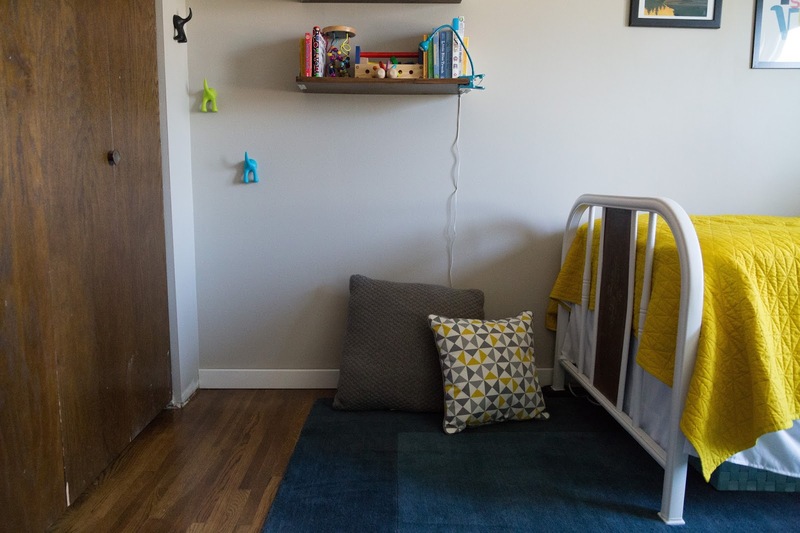 I love desiging kids rooms the best, Avery's room is also on the small side, so I used a bookcase as his toy storage and was able to add a small table and chairs in his room since he has no dresser and it works for us. PS lvoe the new look of your blog!!! 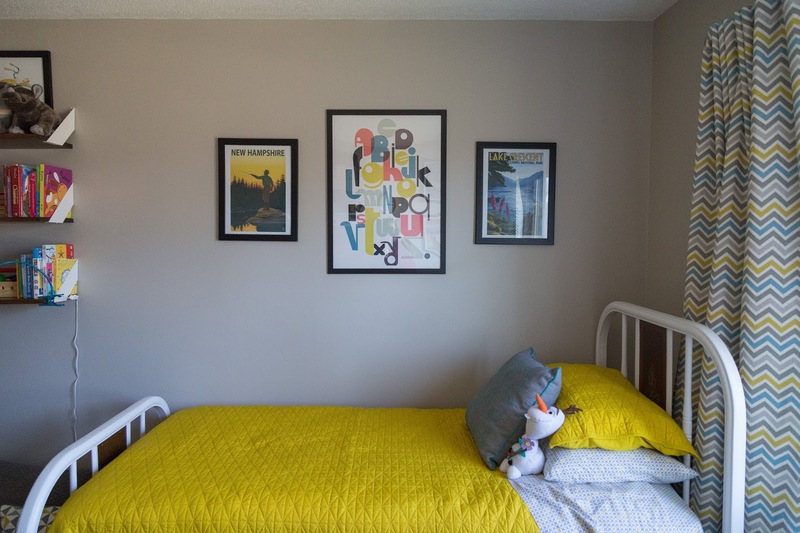 The yellow is such a fun color in here.I love the bedspread and the ABC poster. And also, my kid doesn't say his ABCs. Like, at all. #momfail. Love the colors and the finished reveal. Nice work, Sara. Are you from Chicago? I grew up in the northern suburbs of Chicago. Lived in Winnetka...great place to live! So you think you will leave MN soon? You just got there. Love it when you put up a new post. It looks so great...and I love the bed! 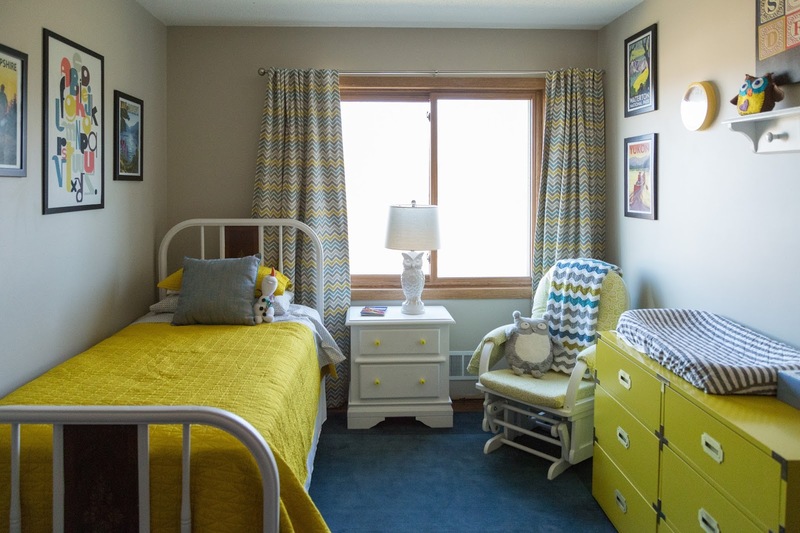 The yellow dresser was awesome before and now with the bedspread I love it even more! Love it all! 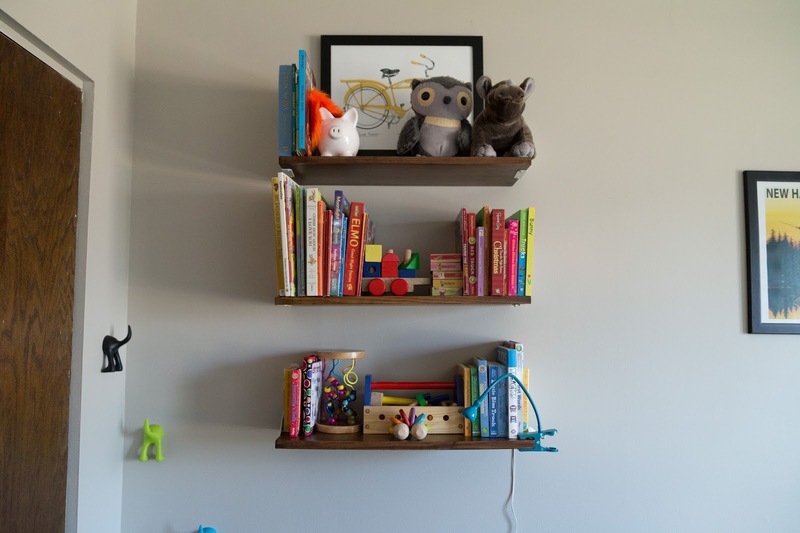 But I am obsessed with those shelf brackets! They look so simple but awesome!!! Where did you find them? I've never even heard of "over under" brackets. Everything looks awesome, he is a lucky boy! That is adorable!!! Love the colors - so unusual and wonderful! 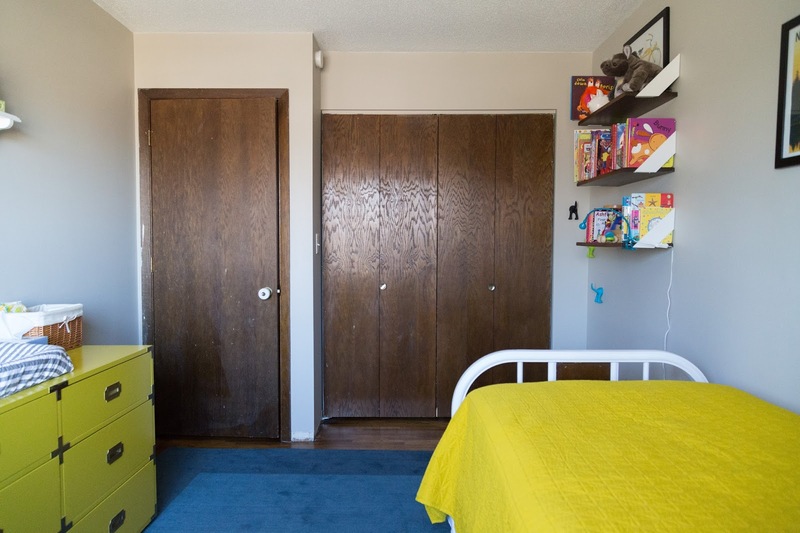 I think I would paint those closet doors a dark gray so they sort of disappear and then add some fun new handles (airplanes, trains, etc.) or spray paint the olds the yellow. Anyway, it will be awesome!! Barb - I am from Racine, WI but my hubby is from the Chicago area, specifically Carpentersville IL. We did just get here, and we won't be leaving any time soon! Sara B - you can get the brackets in the closet organization area of Home Depot, they are also at Menards if you have that in your area? They were like $2 each....great deal! Melissa, painting the closet doors gray is a great idea I hadn't thought of!